I wish all my clients friends, and family Happy Holidays, Merry Christmas, and a Happy New Year. You’re invited to a party or get together and you want to feel festive. What do you do? Do you rush out to the store after work to buy a new outfit? Do you leave everything to the last minute and try to pull something from your closet from things you’ve worn in past years? Do you have a meltdown and call the hostess and tell her you’re coming down with the flu? Any one of these three strategies could bring your stress level up near the breaking point. Maybe you get mad at yourself for leaving these details to the last minute. Perhaps you think everyone else must really have it together and only you have problems over what to wear. Ban those thoughts! Take a deep breath…that’s good…now let’s talk some style sense. 1. There’s good news, you could be more prepared than you realize. 2. By calmly looking at your options, you can get excited about the party instead of dreading it. 3. Everyone goes through fashion breakdowns but you can learn to curb yours with a few tips about how to look festive. Remember those velvet slacks you bought or that velvet jacket you scored this fall. Combine either with lace and pearls and you’ve got a romantic holiday party theme. This skirt is pretty in a print and glissens in metallic gold or silver. Either one can be a key ingredient for a night of holiday cheer. In satin or prints is a comfortable and in-style choice for a Holiday party. Pair them with your favorite sweater or blouse. You will certainly make a statement. 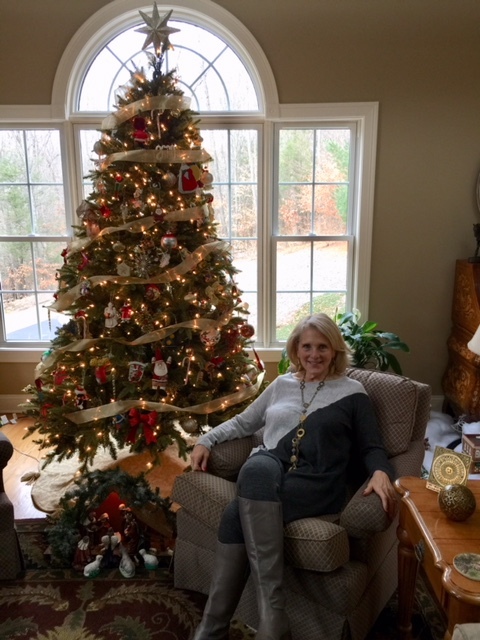 Wishing you and yours a wonderful holiday and a very happy, healthy and safe New Year. Find out more about how to look Polished, Professional and Put Together! In a recent wedding, I had sent Pam a picture of my dress, and she guided me to the perfect accessories- paired with things I never would have thought on my own, I looked fantastic! Because of Pam, I have updated flattering clothes and outfits I enjoy wearing. It’s a very good feeling to receive compliments on my new look! You helped me make up for five years of wardrobe neglect & mistakes! I feel beautiful & confident every time I get dressed. Last night, my husband said “you look beautiful!” You made me feel & see myself differently! I wore my new outfit and was surprised how many compliments I got on that outfit! Thank you for all your help. It makes such a difference having someone knowledgeable and objective to provide support. It has made a big difference in my attitude.